The new kitchen in The Stables has opened up so many doors for us – more space, more room to play, experiment and explore and a definite freedom of not being restricted by the busy-ness of the cafe. One of the first things we did with the new kitchen was to start making all our own drinks. 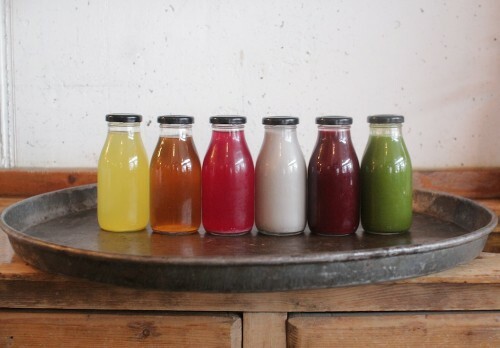 We took all the sugary crap cans out of the fridge and started juicing, making different nut milks and fermenting like mad. Katie Sanderson came back to us in January after an inspirational trip to San Fransisco and took on the project of developing the drinks. She is now officially head of fermentation and is having a great time playing around with it all. 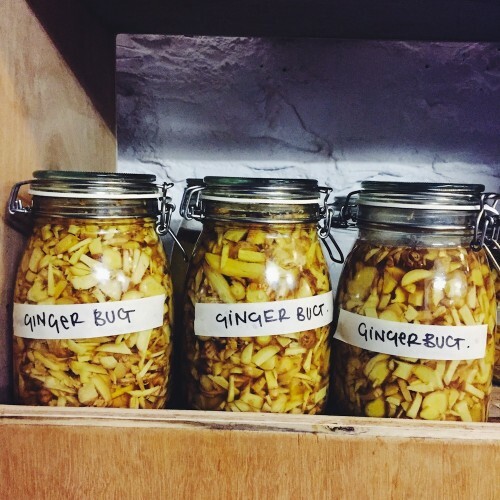 We have ginger bugs burping on every shelf, vats of kombucha and flavored kefir water, we do cold pressed juicing with organic fruit and veg three days a week and Katie came up with a winning flavor combination with the almond and black sesame milk. Keep an eye on the fridge to see what crops up next.